“ACLED (Armed Conflict Location and Event Data Project) is designed for disaggregated conflict analysis and crisis mapping. This dataset codes the dates and locations of all reported political violence events in over 50 developing countries. Political violence includes events that occur within civil wars and periods of instability. ACLED is directed by Prof. Clionadh Raleigh (University of Sussex). It is operated by senior research manager Caitriona Dowd (University of Sussex). Andrew Linke is a consultant on the project (University of Colorado) while the data collection is led by research analyst Charles Vannice. Event data are derived from a variety of sources including reports from developing countries and local media, humanitarian agencies, and research publications. Please review the codebook and user guide for additional information: the codebook is for coders and users of ACLED, whereas the brief guide for users reviews important information for downloading, reviewing and using ACLED data. A specific user guide for development and humanitarian practitioners is also available. Data are available for public download from the data page. Data for all African countries are from January 1997 and are updated in real-time. Real-time monthly ACLED data for African countries is available for download on this or the Climate Change and African Political Stability Project (CCAPS) website. For non-African states, data is available from 1997-2010, with shorter time periods of Afghanistan and Pakistan, which are both covered from 2006-2009. ACLED will begin South Asian real-time coding in 2014. 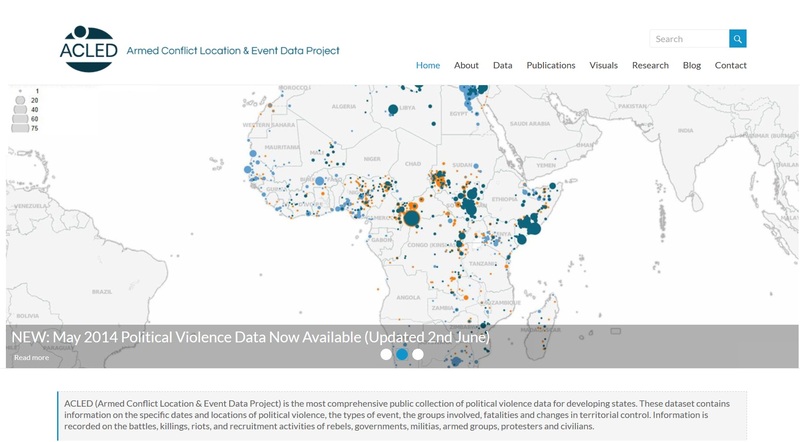 Maps and trend analyses of ACLED data are available: trend reports which review monthly changes and patterns of political violence are available on the Publications page; maps and graphics of real-time violence are available on the Visuals page. If using ACLED data, please cite: Raleigh, Clionadh, Andrew Linke, Håvard Hegre and Joakim Karlsen. 2010. Introducing ACLED-Armed Conflict Location and Event Data. Journal of Peace Research 47(5) 1-10.